I read this article and found it very interesting, thought it might be something for you. 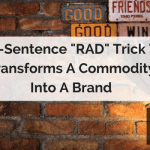 The article is called The 1-Sentence “RAD” Trick That Transforms a Commodity into a Brand and is located at https://copychief.com/the-1-sentence-rad-trick-that-transforms-a-commodity-into-a-brand/. We live in the age of Branded Characters. Leave no lunchbox unclaimed by a caped crusader or a spiffy cartoon. Thank goodness. Who wants a boring blue box when you can have a universe of possibilities unfold every time you reach for a PB&J? And every single character has a little “TM” next to it. Which means no one else gets to use it. That’s the legal part of having a Brand. The exclusive use of intellectual property. But — that’s not where a brand really begins. Because no one is going to care about your tatted-up lunchbox unless the characters on it are something special. That something special is what injects the breath of life into a Brand. I’m talking about the unique combination of storytelling elements like character, image, and plot. And one of these elements is a One-Sentence “Trick” that we can use in our promotions to transform commodities into brands. A CatchPhrase instantly tells us something unique about the character who speaks it. Plus it’s appealing and short – and therefore easy to remember. For example, can you match these CatchPhrases to their characters? Unfortunately, Verizon didn’t have a true branded character; the actor who made this line famous eventually defected to Sprint. Now, you don’t just want any ole’ CatchPhrase. Your product is something special; so your CatchPhrase needs to be special too. Thus, you need a RAD CatchPhrase. 2. Appealing. Funny or fantastic or somewhere in between. When I hear Homer say “D’oh”, I get a smile on my face. 3. Distills a character into is essence. Of all the screw-up dads in sitcom land, Homer Simpson has a shot at the title. And “D’oh” sums up his buffoonery. So give ‘er a try. Pull out a sheet of notebook paper and get to noodling and doodling. Write a RAD CatchPhrase for your product, or your character. That’s when your Product jumps into action. What would your Product say? What defiant cry will it utter that will strike terror into the hearts of the bad guy? Your CatchPhrase signals that the Hero is ready to GO INTO ACTION. To do it’s unique thing that changes the world. Now, even if you don’t actually use the CatchPhrase in your advertising, that’s okay. Because the act of writing it will help you to hone in on the one special trait your Product can boast. Think of it as another route to your USP. The MORAL: Design a “RAD” catchphrase to transform your product into a Brand. I was incredulous when I read the headline. It sounded like total B.S. as a brand is an all-encompassing and much more complex idea than a single sentence. But after reading, to my surprise, I think this is really good advice distilled into and a great way to gut check your tag line. Great article! Thanks, Scott. Thanks, Gerald. Glad it paid off for you.